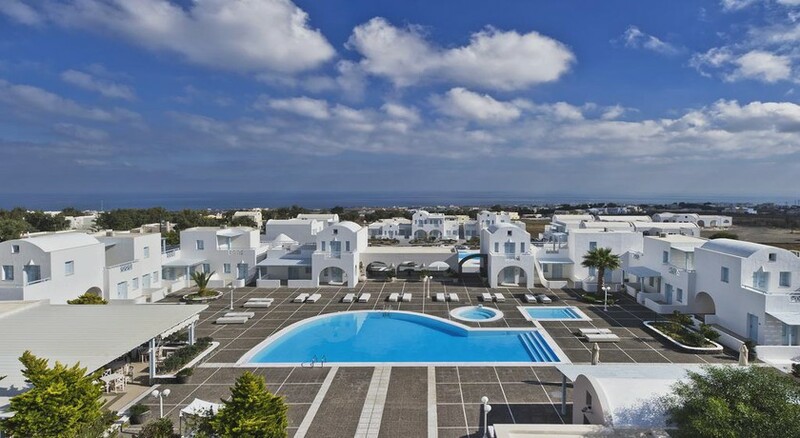 The El Greco Resort Hotel is a luxury, upscale resort hotel located in the town of Fira, Greece. The hotel houses 7 pools, which include outdoor, indoor and children’s pool, and is located just 5.7km from the popular Monolithos beach. The famous Santorini's volcano and hot springs are just 1.9km away from the property. The luxury hotel is known for its traditional Cycladic style of architecture which is designed with prominent shades of white and blue. The hotel has as many as 150 guestrooms on its premises and The luxury resort hotel houses 2 restaurant and a poolside bar that serves a wide variety of international and local Greek cuisines along with alcoholic and non-alcoholic beverages. The hotel also houses a luxury, up-market spa on its premises. 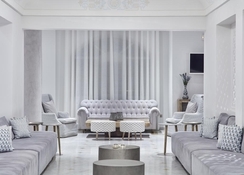 Being in the centre of Fira town, the hotel presents its guests with a unique opportunity to experience the heritage, culture and the modern-day Greek intimately. Local tourist attractions like Museum of Prehistoric Thera, Archaeological Museum of Thera, Megaro Gyzi, Santorini Port, Skaros, Volcano, Art Space Santorini, Ancient Thera, Cape Columbo Beach, Archaeological Site of Akrotiri, Santorini Water Park, Red Beach, Naval Museum of Oia, White Beach and Port of Koufonissiaare are located within a range of 18km of the hotel. On special request, the hotel management can arrange rental cars for local excursions. Airport drop off and pick-up can also be arranged. The El Greco Resort Hotel has 150 tastefully decorated rooms with architectural elements of Cycladic style. The rooms are categorised into four types based on amenities, space and number of occupants. Double Room, Superior Double Room, Family Loft Suite and Junior Suite are the type of guestrooms available at the hotel. All the rooms offer views of the sea, volcano, pool or the garden. The rooms are equipped with amenities like air-condition, mini bar, satellite TV, direct dial phone, safety deposit box, etc. The bathrooms are equipped with amenities like hairdryer, bathtub, shower, toiletries and bath linens. The El Greco Resort and Hotel houses two restaurants and a pool bar. The La Pergola Restaurant serves breakfast and dinner of various international, Santorinian and Greek cuisines. The Ampelos Restaurant serves American buffet breakfast along with dishes of Cyclades cuisine. All the dishes are prepared by the in-house chefs with produces that are locally sourced. The Aeolos Pool Bar serves snacks, a variety of local wines, beers and signature cocktails. The poolside bar offers a calm and soothing ambience. The proximity of the hotel to the town of Fira offers the guests an opportunity to visit the local eateries and bars that serves international as well as local Greek cuisines. The hotel houses 5 outdoor swimming pools, 1 children’s pool and an indoor pool, where the guests can enjoy pool games and a refreshing swim. The hotel also houses an upmarket spa and wellness centre, Lotus Spa, where the guests can pamper themselves and enjoy massages and wellness treatments. The guests can hire a car and visit local tourist attractions like Museum of Prehistoric Thera, Archaeological Museum of Thera, Megaro Gyzi, Santorini Port, Skaros, Art Space Santorini, Ancient Thera, Cape Columbo Beach, Archaeological Site of Akrotiri, Santorini Water Park, Red Beach, Naval Museum of Oia, White Beach and Port of Koufonissiaare. The guests can also visit the famous Santorini's volcano and the nearby hot springs, which is just 1.9km away from the hotel. Went to Santorini for a wedding and stayed here as the bride & groom were- we were not disappointed at all! Lovely rooms, cleaned daily, 4 pools, plenty of sun loungers yummy lunch menu at the poolside bar with generous portions. Drinks slightly on the expensive side but maybe that’s that € vs £ these days... supermarket 5mins walk away so always stocked up on drink and snacks. Gorgeous Thira town is less than 10mins walk away. Would happily stay again & recommend!